Bumper stickers fade some after 5 years in the Nevada sun. For more than five years residents of the Comstock tried to keep an upstart mining company from digging an enormous pit mine in the the Virginia City National Historic Landmark just above Devil’s Gate in Gold Canyon. Despite our efforts the pit was dug. But the mine was a bigger failure than the resistance. More than $200 million in stockholder money spent over five years with nothing to show for it except an endless chain of zeros in the profit column. Hundreds of protest signs were posted by local residents when CMI announced its presence..
Why? Because the company’s inexperienced executives indulged in aspirational prognostications, and what they discovered when they dug was: there was no ore there. Ore is defined as “a metal-bearing mineral or rock, or a native metal, that can be mined at a profit”. So metal-bearing minerals or a native metal mined at a loss might be rich dirt, but it is just dirt, not ore. 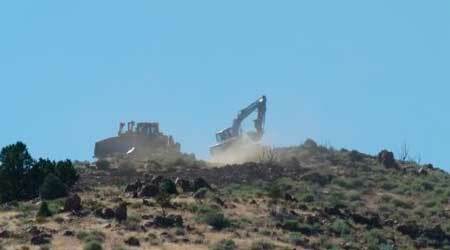 There are huge heaps of this rich, unprofitable dirt uglifying American Flat, and the immense hole in Gold Canyon called the Lucerne Pit isn’t going away. So, let’s make lemonade. 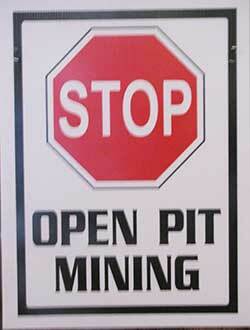 Let’s get our Tourism marketers to promote the Lucerne Pit as a new attraction on the Comstock. Call it the Monument to Futility or to Overenthusiasm or Wishful Thinking — we can hold a national contest to select the name. After all, it will be a big part of the National Landmark for the next hundred thousand years or so. A Viewpoint with parking will invite visitors to look into the abyss, and informational signage can tell the story of how Comstock Mining Inc (or is it LLC?) became the biggest loser in the history of the Lode. These informational placards can perpetuate the names of the County Commissioners who so eagerly welcomed CMI into Storey County to dig this hole without a credit check: Hess, Sjolvangen and Kershaw; Gilman, McBride and Mcguffey. In big letters please. 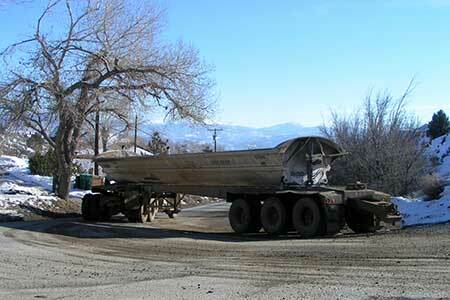 Mention can be made of the company’s unwillingness to monitor air quality as it put dust into the air from this national priority mercury Superfund site. And the $250,000 fine imposed on CMI for a major environmnetal violation adds a touch of humor. With the eager assent of Storey officials, most of that amount went for the purchase of a street sweeper delivered to the county, which the company described as a ‘Special Project’ when it was handed over. Everyone was smiling, presumably to keep from laughing out loud. The displays can point out the futility of trying to replicate the glory days of the 19th century in modern times. This was a great place to mine gold and silver in the 19th century, now not so much. 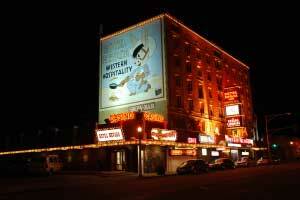 THE EARP BROTHERS SEEK THEIR FORTUNES IN NEVADA. 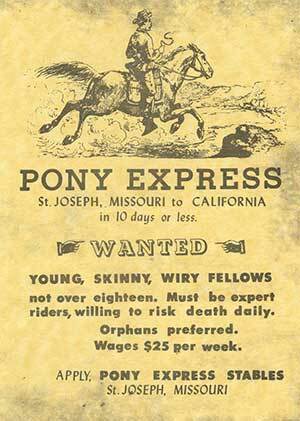 Life in the Old West—Hollywood notwithstanding—was often mundane. The deadly gunfights and daring hold-ups were comparatively few. Yet, certain names have attained legendary status, selling countless books and millions of theater tickets, while the reality was considerably less exciting. 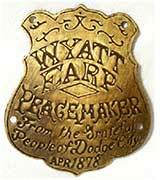 No two figures attempted to live quieter lives, yet were haunted by largely undeserved reputations, than brothers Wyatt and Virgil Earp, as their sojourn in Nevada would prove. As with many in the West of the late 1800s, Wyatt and Virgil were basically drifters—sometime gamblers, sometime lawmen, middling businessmen, wannabe politicians—searching for the big payoff. As visitors to the Overlook take in the view, they will not see much of the Comstock as it was. Apart from the huge hole, the company has completed ‘reclamation’ of some of its upcanyon property, and has made a new bed for Gold Creek on its way to Devil’s Gate. Mom Nature’s treatment of the Comstock landscape was rough and rocky, with holes all through it. As J. Ross Browne famously described it, this was a place where the bones of the earth show through its skin. Where the company had been at work, Gold Canyon has had a make-over. No more tangles of rusting cable poking out of the tumbled ground, no brick footings from long-forgotten structures devoted to long-forgotten uses, no more tipped and tilted posts, flattened oil cans, shards of crockery, broken bottles, traces of old roads interlacing on the hillsides. All gone from the west side of the canyon. This section of old ground has been given a new look better suited to a suburban park than a historic landmark on the western frontier. Every contour is smooth, supple, modest and mild, with focus points of big boulders strewn carefully about for contrast. This is in contrast to the scarred and raggedy landscape that existed here, and that it pretends to reclaim. 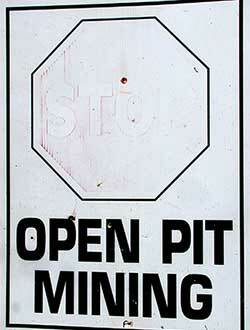 We know what the pit cost CMI to dig . . . but has anyone computed the value of the authenticity of the Historic Landmark that was sacrificed when this prettified landscape was substituted for the real one? If this were an opera — which it deserves to be — the fat lady would be standing in the wings, spraying her throat. So prevalent is the local understanding that CMI has failed that the Comstock Chronicle (one of two newspapers in Virginia City) asked the celebrated John Tyson, a former CMI employee, to pose as a journalist and interview CMI executive Scott Jolcover about it. The resulting article — reposted here — should be required reading in journalism schools as a sweet piece of puffery. John lobbed his questions over in slo-mo, big fatties the size of beach balls, whistling Yankee Doodle on their way to the plate, so even a blind man could hit them. So many things about Nevada seem counterintuitive. In that vein, Nevada tourism officials seized on The Loneliest Road pejorative as a marketing slogan, and created signs, stickers and brochures touting such. Cedarville is at the foot of the mighty Warner Mountains and is the principal community within the Great Basin’s northwestern rim. Much of this section of eastern California was once claimed by Nevada and embraced within Roop, and then Lake County. Cedarville was still called Deep Creek when it was a part of this short-lived Nevada province, and I still claim it for Nevada, as it is a delightful place: pretty as a postcard, well provisioned with food and drink (yes, you can get a latte), and provided by a benign providence with an excellent bookstore. And the Modoc County Fair is a dreamy mix of nostalgia, hilarity and cowboys. 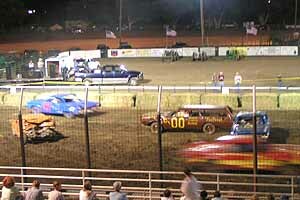 The Demolition Derby was a huge crowd-pleaser. Race you to the beer booth! What’s a parade without goats? Whatever it is, it’s solar-powered and it squirts water. It’s hard to pick a favorite moment from the many, but maybe it was at the baking competition, where the pies and cakes were displayed: there was only one little sliver left of the pie that won Best of Show. They were right, though, as the lonely quality also makes this one of the most sublime corridors I have ever experienced. Much of the time it reminds me of Jerry Bruckheimer’s film intro logo, the boundless straight road and the lightning bolt. After hours of nothingness, it seems we’re driving ever closer to the origins of the earth. A tumbleweed sweeps across the road, whispering some hoary invitation to explore beyond the pavement. 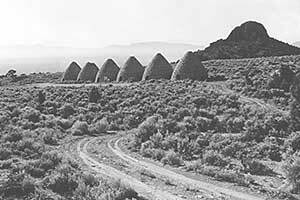 So, we make a short detour down a gravel road into the Ward Charcoal Ovens State Park, featuring a series of six 30’-high beehives built in 1876 to burn locally-harvested timber for use in smelters at a nearby mine. As usual throughout the trip, we are the only ones here, and we step in and out of the giant charcoal kilns, self-stamp our passports, and vanish down the road. We seem to be navigating a large unfurnished chamber in this next stretch, but it is an occasion with room to think; room to breathe. The interstice is rich here. In the little community of McGill we stop at the Rexall Drugstore, but it’s not like my neighborhood Walgreens. Stepping inside is like stepping through a time-warp, as though half a century ago the owner went out for a cigarette and never came back. We’re met by Daniel Braddock, dressed like my grandfather’s pharmacist in bowtie and white paper hat. The shelves are lined with faded products dating back to the 1950s, from the once popular Dippity-do styling gel to Ipana toothpaste. Daniel, an irenic soul who makes peace with the past, gives an archeological tour down the memory lanes, finally showing off the space in the back where home remedies and prescriptions were mixed in-store, next to stacks of original invoices, dating back to 1915. 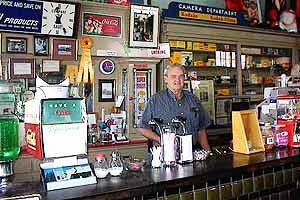 Before we leave he dollops double scoops of ice cream at the old fashioned soda fountain, and hands them to us to lick vanilla memories. After days of nights in darkness, we pull into the neon wash of Ely. The road has rendered me unfit for glitter, so I sit in the car decompressing for a few minutes before checking into the Hotel Nevada and Gambling Hall, which has its own little walk of fame out front. 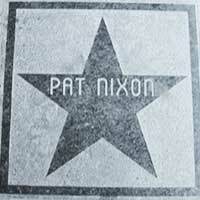 There are stars in the sidewalk for Pat Nixon and Lyndon Johnson. I ask the receptionist why the stars, he replies they are for celebrities who stayed at the hotel. 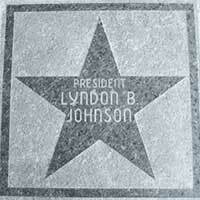 “Pat Nixon and Lyndon Johnson. Same room?” I query. The receptionist draws a sly smile; silently hands me the key. August is teaming with things to do in Nevada. On the east side off of Highway 50 in Ely go to the Bristlecone Arts in the Park Festival on August 6th and 7th. The very next week on August 12th and 13th check out the White Pine Rodders’ Car Show at the Courthouse Park on Aultman Street. 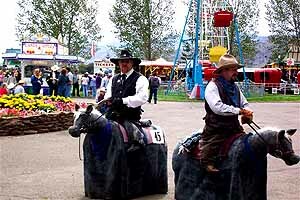 Then on August 19th through the 21st Ely hosts the White Pine County Fair and Horse Races. So much to experience around Ely: Cave Lake, Renaissance Village, historic train, museum, Garnet Hill, Art Bank, and the famous Great Basin National Park nearby and plenty of good places to stay and eat. 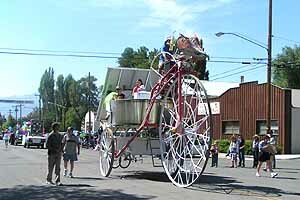 . . From Ely travel west on Highway 50 and attend the Eureka County Fair on August 11th through the 14th. Continue west down Highway 50 and turn south Nevada State Route 376 for Kingston Days which is scheduled for August 6th. just over the hill will be the Annual Austin Fly-In on August 20th . 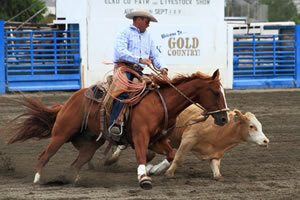 . . Also on Highway 50 Fallon plays host to it’s own Ranch Hand Rodeo on August 6th and 7th. On August 27th you won’t want to miss the excitement of Fallon Fights, Rural Rumble. . . In Carson City, Nevada’s State Capitol come on out to the New World Jazz Project at Legislative Plaza on August 21st at 4:30pm to 5:30pm. 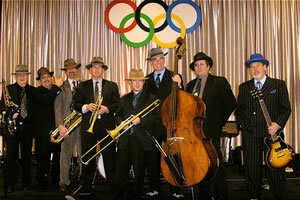 On August 13th there is a Speakeasy Swing Dance Party Jazz and Beyond Festival at the Brewery Arts Center. On August 20th go to the Outlaw Flat Track Motorcycle Races at Fuji Park. Get your tickets here. . . Take Highway 50 up past Spooner Summit to the majestic Lake Tahoe for the Hot Tahoe Cruisin’ South Shore Car Show at the Heavenly Village that starts on August 1st and will last though the 7th. On the west side of the lake you won’t want to miss Tahoe City Days on August 5th through the 8th. On the east side of the lake the Lake Tahoe Shakespeare Festival continues to until August 21st. 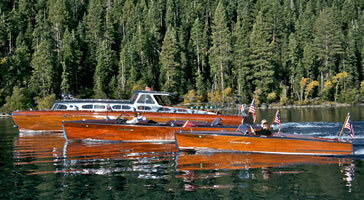 Out on the water… No really go out on the water, this is a glassy, clean cool experience that says, “you haven’t lived until you do”, so bring yourselves to the magnificent Concours d’ Elegance Wooden Boat Show at Homewood on August 12th and 13th. Sail back into the 1920s at the Great Gatsby Living History Festival on August 13th and 14th. The fun starts at 10:00 am and lasts to 4:00 pm. On the south end of the lake goto the Meyers Mountain Bike Festival on August 13th and 14th. Hard Rock Hotel & Casino will host the Lake Tahoe Reggae Festival at Stateline on August 20. On August 27th is the BBQ, Beer & Beats Festival at the Lake Tahoe Golf Course. Also on August 20th is the XTERRA Lake Tahoe festival at Donner Lake, an all time classic off-road triathlon course. The Lake Tahoe Music Festival features Sunset Serenades with a 20-Piece Academy Orchestra on August 16th through 21st on the west shore of Lake Tahoe, Tahoe city and Truckee. 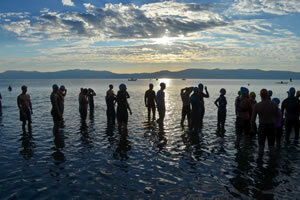 On August 27 and 28th check out the Lake Tahoe Triathlon at Sugar Pine State Park. . . Down the hill in Reno, come on out to the Greek Festival on August 19th through the 21st. Also on the 21st is the Duck Race and Festival that takes place in the Truckee River at Wingfield Park in Downtown Reno. On August 26th through the 28th is Reno Tahoe Music Festival at Robert Z Hawkins Amphitheater, Click Here for tickets. Not to be missed is the Reno Aloha Festival that takes place on August 27 at Wingfield Park in Downtown Reno . For the hungry in you go next door to Sparks Nevada fo the “Best in the West” Nugget Rib Cook-off on August 31st through September 5th in Victorian Square. 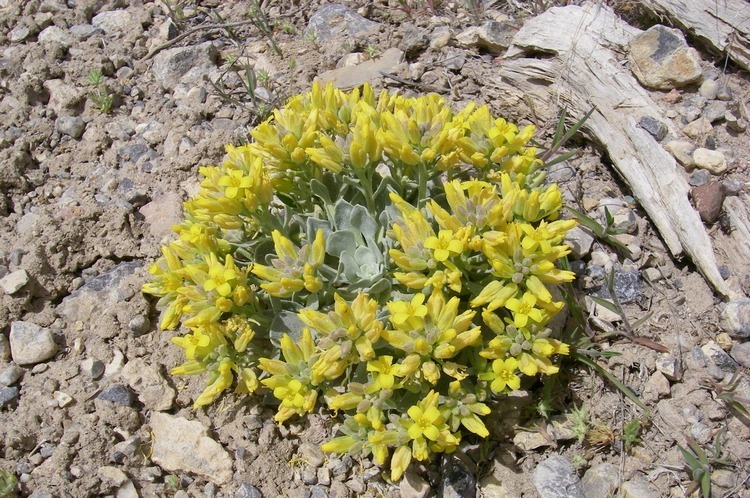 . . South of Reno in Carson Valleu off US Highway 395 goto the CVI Summer Fun Shoot on August the through the 9th. In Minden come on out to a Main Street Event Car Show on August 12th that will have plenty of food, drink and music in the heart of the scenic Carson Valley. Also in Carson Valley on August 20th and 21st is the American Legends & Wild Horses. . . Up on the Comstock, in Virginia City and down to Silver City is the annual Ferrari Hill Climb and Parade on August 27th. . . Headed east on Interstate 80 through the Silver state will take you to Winnemucca where on August 19th through the 22nd will be the Winnemucca Good Times Drag Strip and August Good Times Race at Winnemucca Regional Speedway. 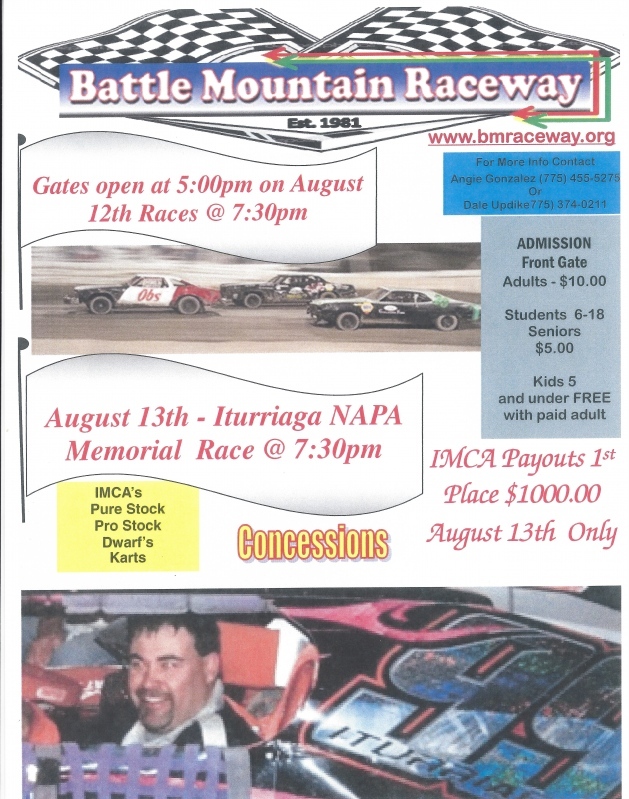 Further east on I-80 is Battle Mountain’s Silver Kart Classic that takes place on August 12th and 13th and then on August 27th is the Battle Mountain Burners 7th Annual Car show. . . After traveling past Battle Mountain you will reach Carlin and on August 19th through the 21st Carlin will host a Ranch Hand Rodeo and Sho N’ Shine and Art in the park. Not far east of Carlin visit Elko for it’s County Western Heritage Festival that is scheduled for August 4th through the 8th. Also in Elko on August 27th through the 31st is the Elko County Fair and Horse Races. . .In the far east of Nevada on I-80 in Wendover on August 27th is the Wild West BBQ Shootout . 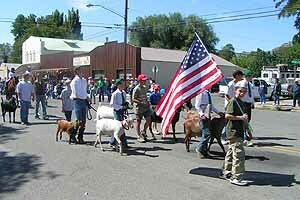 . . Way up to the far north of Nevada is the annual Jarbidge Days that takes place on August 12th through the 14th. Call (801) 731-9519 for further information . . . 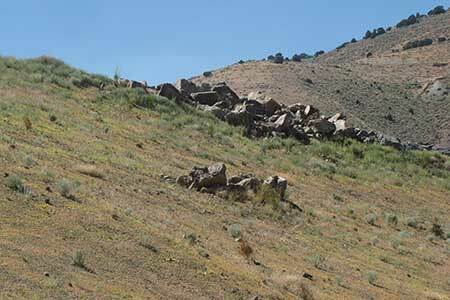 If you are traveling through Nevada southward take a stop in Tonopah on August 8th for the Tonopah Trail Challenge. Or on August 19th and 20th goto the Best in the Desert 20th Anniversary race from Vegas to Reno, the nation’s longest off-road auto race, and on August 27th pop in for the Old Timers Picnic held in Jim Butler Park Tonopah. On August 5th through 7th, be sure to attend the 16th Annual Goldfield Days Celebration & Land Auction! . . . Settled under the Spring Mountains in Pahrump on August 27th and 28th is the 2016 Super Arena World Cup Championship & National Super Arena Final Round of USA Championship. On August 8th through the 10th is the Lincoln County Fair. On the southeastern side of Nevada goto Mesquite Fine Art Center’s August Exhibition & Competition that will start on August 1st and last to September 3rd. . . Down to the southern tip of Nevada in Boulder City is the Bootleg Beatdown on August 20th. In Henderson make sure to attend the Pirates of the Colorado River Regatta on August 11th through the 14th. Across the valley in Las Vegas on August 5th through the 7th is the on August 20th. 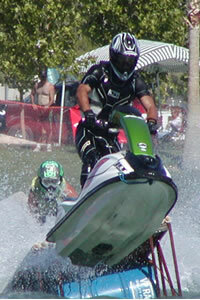 In Henderson make sure to attend the Pirates of the Colorado River Regatta on August 11th through the 14th. 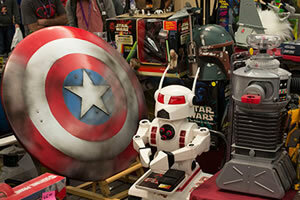 Super Toy Con at the Orleans Casino Resort. At Clark County Highschool, delve into the mystique of Japanese Buddhism at the Buddhist Sangha OBON Festival on August 6th. 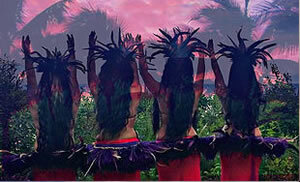 Honor Hawaii’s culture & history at the Kumukahi Ukulele and Hula Festival on August 12th and 13th at Sam’s Town. Click Here for tickets.